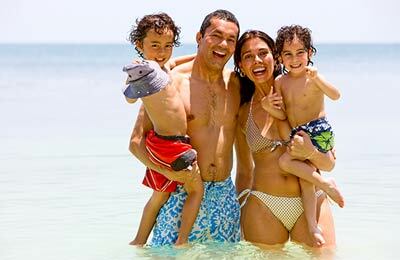 Using AFerry, you will always get a great deal on your ferry to Poland. See below for timetables and the latest special offers for your Poland ferry. Booking a ferry to or from Poland couldn't be easier with AFerry. You can either use the booking form at the top left of the page. 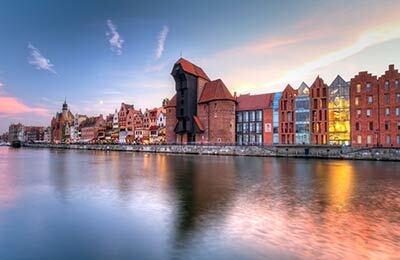 Poland is a beautiful and culturally rich country that has been relatively untouched by mass tourism. 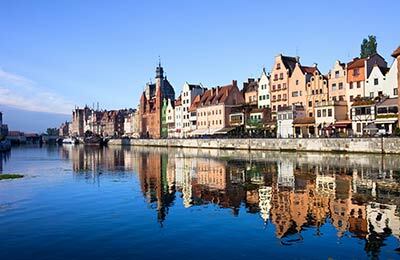 Poland has lively cosmopolitan cities along with mountainous scenery and sandy beaches. Visit Warsaw to experience Poland's cultural delights such as theatrical productions, opera and museums, or travel to the Carpathian mountains to enjoy spectacular views, traditional folklore and excellent sports facilities. See the Icon of the Black Madonna, also known as the miraculous painting of Our Lady, in the huge Jasna Góra monastery complex at Czestochowa, 100km (60 miles) north of Kraków. You can take an elevator to the 30th floor observation deck of the Palace of Culture and Science for a great view of Warsaw. Situated at the centre of Europe, and the largest of the former Eastern European states, Poland is fast becoming a key member of the EU. Its main ferry ports are Gdynia and Gdansk. Cheap and efficient InterCity trains are operated by Polskie Koleje Pañstwowe. These are fast, clean and efficient. However, the infrastructure of the railway is quite old and it may well be quicker and cheaper to use the bus for many routes. By car, be aware that traffic drives on the right, and standard international traffic signs are used. Major inter-city routes use the prefix `E' and motorways use `A'. Petrol stations located along main routes are open 24 hours a day. Road quality ranges from smooth brand new motorways to pot-holed single lanes. The principal city in the southwest and the capital of Lower Silesia, Wroclaw (Breslau) is the cradle of the Polish state as it here that the Polanie tribe built their first fortified settlement on Ostrow Tumski Island. Visit the Carpathian Mountains, including the Tatras. These lie in the extreme south and the mountain scenery, folklore and sports facilities make them well worth a visit. Poland is a nation with a proud cultural heritage and strong theatrical and musical traditions. Warsaw and the main cities have theatres and opera companies that put on a whole range of musical and cultural programs for both locals and visitors. Poland shares borders to the east with the Russian Federation, Belarus, Ukraine and Lithuania, to the south with the Czech Republic and the Slovak Republic and to the west with Germany.